French cultural public policies are characterized by a strong public intervention, at the State or at the local level. Their aim is to make culture and art accessible to the public. With the introduction of new technologies of information and communication, administrations in the cultural field can promote culture through an innovative process: the open data. This movement of releasing public data has been adopted by the French administration since 2010 in local collectivities. Under the Fillon’s government, a law was passed on May 26th, 2011 to create an agency called Etalab to open the new French open data website data.gouv.fr, whose role is to collect and publish data of the Ministers. François Hollande and his Prime Minister Jean-Marc Ayrault with a Charte of Deontology pursue this movement. The BnF has the missions to collect, to conserve and to spread the document heritage of France. The BnF has to describe all the edited documents it is receiving and it has also make its heritage accessible to the public. 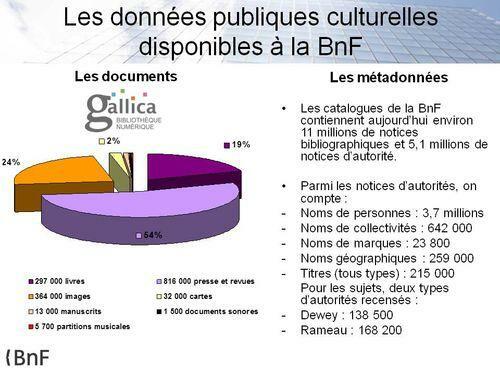 With the Internet raising, the BnF decided to release not only the documents it receives inside its walls, but also in the Web, through data.bnf.fr, after having also created another portal, called Gallica (the numeric library, which is used to get directly to digitized documents). In July 2011, the BnF launched a partnership with the private sector to digitize those documents, for a total amount of 150 million euros. (3) Five centuries of literature are concerned and ancient manuscripts must be extra taken care of. Those documents will be added to the portal Gallica, which already gathers 1,5 million documents. This exploitation of the public domain, to make those data profitable to private firms, underline the difficulties to conceal first the interests between the public sector and the private sector, and the issue to make profit on public goods. However, it is also a way to make those data better known. Using the semantic Web and the linked open data, the data.bnf.fr portal is covering more and more authors and works. The BnF is now inside an ecosystem as its own web pages are redirecting to other external websites, to create a cloud of cultural data. Immerged in this environment, the BnF isn’t anymore alone, but is using the network of other organizations, either public or private, to make its work known and especially to the citizens. The BnF signed a partnership with Wikipedia to correct collaboratively 1400 digitized documents that are difficult to identify. (9) This partnership ecosystem is used to widespread the BnF work and legitimacy, in order for citizens to get to know this huge library of data.